The film tells the story of Jan Karski, a courier for the Polish underground who bravely crossed in and out of Nazi-occupied territory bringing eyewitness testimony about the Holocaust in a desperate attempt to stop it. Karski infiltrated the Warsaw Ghetto and a Nazi transit camp and carried his harrowing reports of the atrocities to the United Kingdom and the United States, hoping to shake the consciences of their powerful leaders or  as called them  the Lords of Humanity. Grunberg's innovative fusion of live action and animation creates a unique film reality and brings Karski's compelling story to life. The film makes use of animated, fictionalized scenes intertwined with documentary and archival footage, including authentic voice-over by Jan Karski himself. 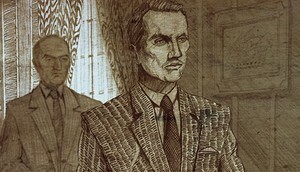 Grunberg uses the animation to recreate the events which took place during Karski's World War II mission, augmented by Karski's narration, drawn from hours of archival interviews. Karski's mission highlighted some of the most challenging ethical and historical dilemmas of the 20th century. His story is a lesson about the best and the worst in human nature. It transcends common wisdom about this terrible time in human history and makes the case that even amidst unimaginable pain and suffering, heroes can still be found. E. Thomas Wood is a journalist, whose investigative, business and historical works appeared in The New York Times, The Wall Street Journal and numerous other newspapers and magazines. He is a graduate of Vanderbilt University and holds an M.Phil. degree in European Studies from the University of Cambridge.